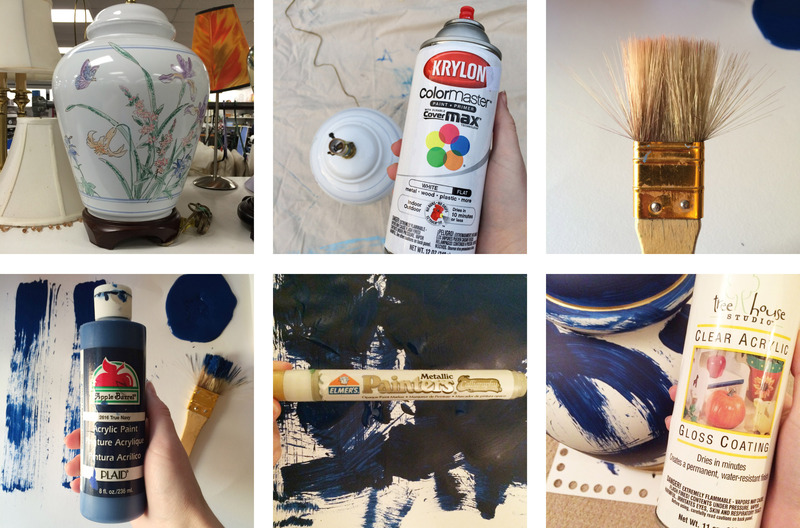 blogger’s note: I’ve been getting lots of inquires about the brush stroke lamp I created out of a Goodwill find. This post was originally published as a collaboration with one of my favorite health and style bloggers, Peaches to Pearls. The Jana Bek inspired design is a quick and easy weekend project that makes a statement! Hello Peaches to Pearls readers! I am so honored to be guest blogging for Luisa today! Let me start by introducing myself. My name is Tarah. I’m a 24 year old graphic designer from Charleston, South Carolina. When I’m not painting, eating up the holy city (literally… yum! ), or sending beach pics to my freezing loved ones in Chicago, I write Blanc – a lifestyle blog for professional newcomers. Besides being President and Vice Pres. in the 5’2″ and under club, little Miss Luisa and I have a lot in common: we believe a pop of color makes the outfit (or room), a doughnut is better with sprinkles, and that you don’t have to spend big to go big. Oh! and we can’t pass up the J.Crew sale rack. 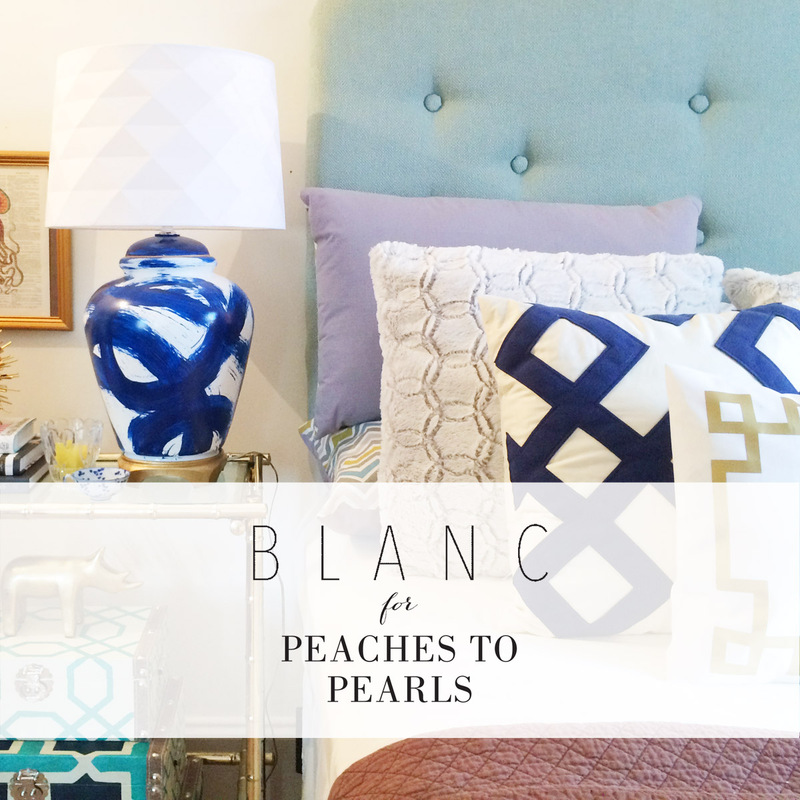 Today, I want to share with you a little about Blanc. It is my mission to relate: to share my experiences and to tell you the tales of what young 20-somethings could really use in life (or just for fun! ), rather than which $59 platter you should buy. Because at some point in our lives, we are all new. We are a clean slate, we are fresh eyes, we have yet to be molded. We are blanc. If you’re starting to say say “cut to the chase Tarah – how do I make that damn lamp,” then don’t worry, I got you girl. 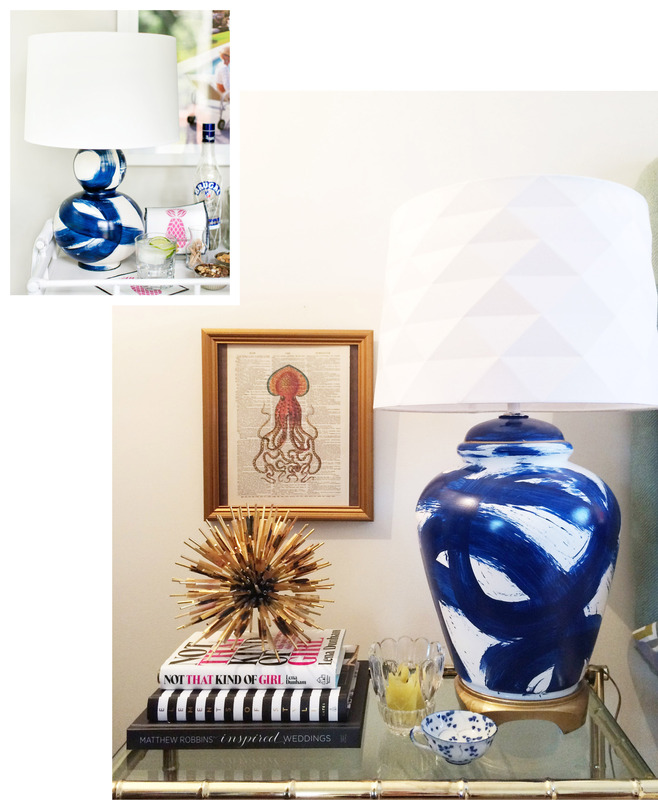 Today I’m going to share with you a designers hack: my $25 lamp created to mimic one of my favorite interior designers Jana Bek’s (http://janabek.com/the-shop/) legendary beacon. Step #1: Let’s start with the lamp. I found this show stopper at Goodwill for just $5! Notes on finding the perfect fit: pick a lamp with a large surface area. This allows your pattern to translate easier. Step #2: Spray prime and paint your lamp. 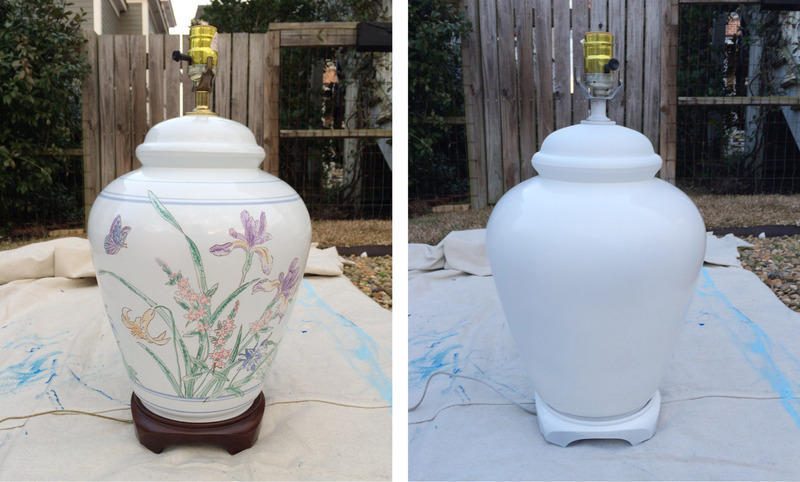 Be sure to hold your spray can at least 8-inches away from the lamp in order to get an even coat. Step #3: Let the painting begin. Create a scene of large and small overlapping ovals. There is no proper way to methoidize this step, so just go with the flow! Painters tip: I used an paint brush with hard brissles and mangled them pre-painting. Since the goal is to get a brushed look, I wanted the ends of the brissles to be a little flared. Step #4: Accenting the lips. Every girl loves a good stained lip and so will your lamp. 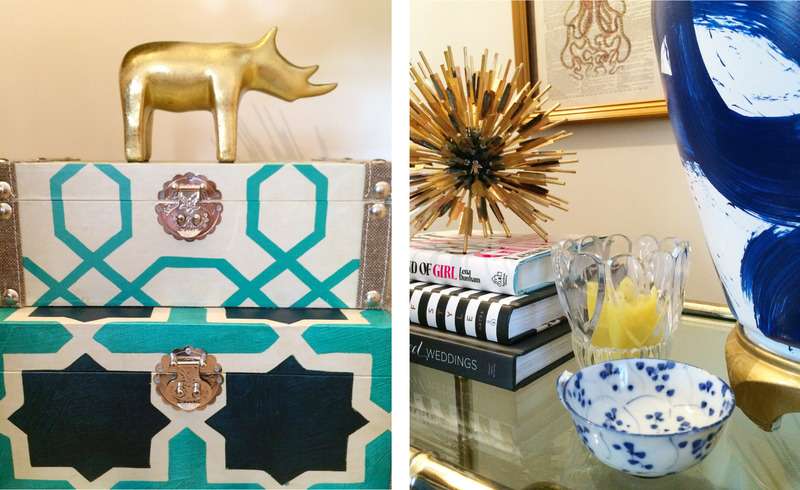 I chose to paint my base a metallic gold to add a pop of sophistication. I used a paint pen that I had on hand, but metallic paint will work as well. Step #5: Seal the deal. Coat your final product with a gloss finishing spray to add dimension. Step #6: Add the accessories. 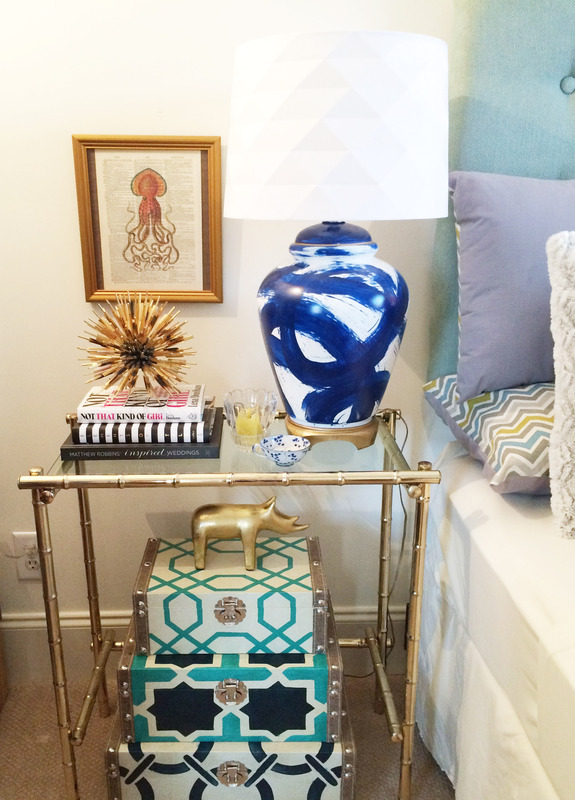 I topped my designer-look alike off with a geometric lamp shade I found at Target (on sale for $24.99). When always looking your best is our #1 priority – let’s face it, we all want Luisa’s closet…SWOON! – we tend to forget to dress other parts of our lives: our home, our creativity, and sometimes our diet. I challenge my fellow Peaches to Pearls followers to do something creative this weekend. Create your own Jana Bek look-alike, organize your closet (see my tips here (http://blanc-blog.com/2015/01/19/team-organization/)) or simply make a Valentines day card for a friend. Share your findings with me on social media via @blancblog and hashtag #boldwithblanc. love this! I love the whole nightstand ensemble, actually! Great job!